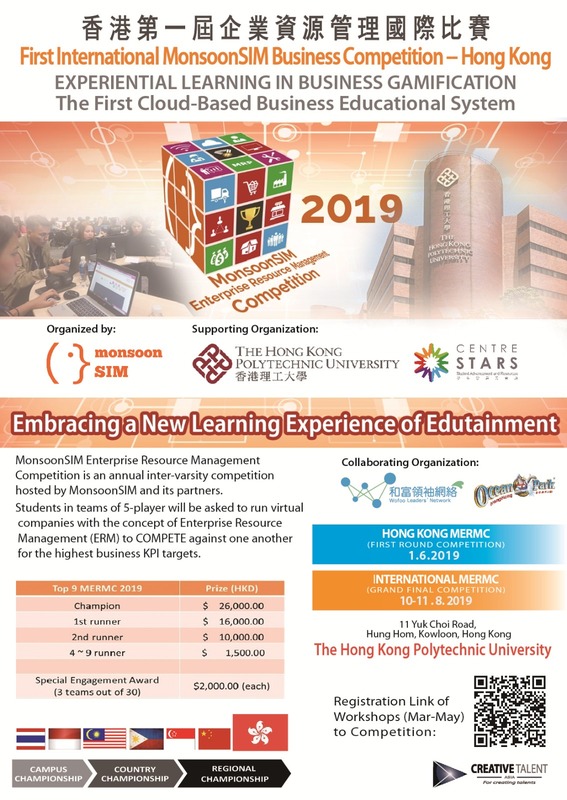 Attracting thousands of participants from universities across SEA and Hong Kong, MonsoonSIM Enterprise Resource Management Competition (MERMC) International Grand Final Hong Kong 2019 is going to be held on August 10th & 11th at The Hong Kong Polytechnic University. This year's competition overall is a true upgrade to all the previous ones. Firstly, the latest upgrade of MonsoonSIM (MonsoonSIM 7.0 launching date: April 2019) will be the version used in the Competition. Secondly, a more exciting qualifying semi-final round will be introduced to the competition. We will provide more update on the rules soon. Thirdly, we announce that there is a substantial increase on the winnings of the qualifying teams in the Final. We will provide more information regarding Trophy & Medal soon. Fourthly, MERMC Hong Kong 2019 offers an additional award this year. This Special Engagement Award is HKD2,000 for each of the 3 winning teams. According to our Hong Kong partner, Mr. Michael Chan of Creative Talent Asia Limited who is the co-organizer of this year's event, the interesting thing is, these 3 winners can be any 3 teams... based on the best combined scores given by the head CT of each participating country from the scoring matrix selected for the day. Lastly, special gifts as Adventure Award will be accorded to the top 3 Adventure Game teams who have narrowly missed out on their place in the Final. This year's competition is sponsored by Centre Stars of The Hong Kong Polytechnic University and Creative Talent Asia Limited, and put in place through collaboration with Ocean Park Hong Kong and Wofoo Leaders' Network. MonsoonSIM actively, continuously and contentiously welcomes sponsorship from Organizations who are keen to promote Education and the cultivation of our youth at the forefront. Competition closing date for Country Final team registration is forthcoming. Do your teammates, university, lecturers, country proud by framing your university in our 2019 MonsoonSIM ERP Competition Hall of Fame! Include your team contribution, efforts to your personal goals and Resume! We can not go by not saying that this year's awards is the best it can be!! * 2019 Competition is twice more fun and challenging than the years before. * 2019 Competition Prize Awards are higher than before! * Anyone who reaches the 2019 FINAL is a WINNER and walks home with a PRIZE!